Monday night at Lyra’s Restaurant Rondebosch is just not another week night, it’s Jam Session Night, so one can expect a night of cool jazz by mix of the numerous musicians, instruments in hand waiting to be invited on stage, just a figure of speech, on the floor to perform. Damn, the Klutz has cracked the whip, so got to get on with the task at hand, evaluating the service, food and ambience. On arrival I was taken to my booked table with a menu laid down and asked what I wanted to drink, so naturally I said beer, draught beer. On asking of the draught beer menu I was hoping for a long cool Heineken, but told they only had one beer on tap, expecting the worst, Castle, I was told they only had Windhoek much to my relief, as that was to be my second choice. After a long wait the amber cooling liquid arrived, icy. Being thirsty I took a long hard quaff of the magical golden liquid of the god’s immediately knowing that it would not last long. After that sipping away merrily as the band was setting up, perusing the rather shabby, sorry looking menu, scuffed and plastic cover torn whilst waiting for the All Jazz Radio Webitor, Carol Martin to arrive. I was told that they have a Jam Session special which one could choose, in any combination, a pasta dish and a pizza for under a 100 Bucks which to a poor and highly underpaid Online Jazz Radio Presenter’s wage was very good value, indeed. Being a chef the klutz knows the margins on such dishes.
. I knew immediately what I was going to have because when Pasta is involved it’s got to be Lasagna, the yardstick I judge and evaluate Italian style eateries on. Between chatting and quaffing the Draught, the damn glass emptied just far too soon, also being a warmish evening helped do the job too, so I naturally ordered another. Doing the knife stab test in the Lasagna and holding it in the centre of the bowl of what looked really yumolicious Italian baked perfection. The knife came out at the perfect temperature, so partially satisfied I tucked quickly in to the tasty, cheesy, tomato meaty goodness that oozed out of the pasta layers and with a sprinkling of pecorino all over the top it was yummolicious. It was Lasagna that even the baked pasta-devouring machine that is Garfield would truly have enjoyed and respected, compliments to the chef. Carol said she enjoyed her Linguine Alfredo which Lyra’s on their menu says it’s a Classic with ham, mushrooms and sliced peppers in a cream based sauce. Sadly not a classic Italian Alfredo because the true Classic Alfredo dish is made of fettuccine tossed with Parmesan cheese and real butter and that’s it, no cream or anything else then it may be called an Alfredo. 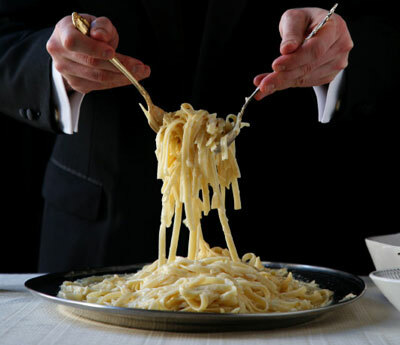 Alfredo Di Lelio, who was a restaurateur who opened and operated restaurants in Rome, Italy, throughout the early to mid 20th century, named the dish, sjoe! the Klutz is just showing off now. All in all it was an enjoyable evening whiling away the hours with good food, good beer, good friends and jazz, not a shabby way to spend a Monday night. I shall return. 250g finely grated Parmesan, pecorino can be use at a push it’s a little cheaper. Bring a pot of salted water to a boil. Add fettuccine and cook, stirring occasionally, until pasta is al dente, about 8 minutes. Meanwhile, cut butter into thin pats and transfer to a large, warmed platter. 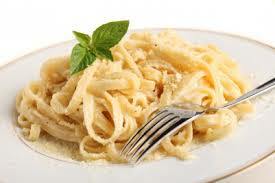 Drain pasta, reserving 3⁄4 of a cup of the pasta water, and place the pasta over the butter on the platter. Then sprinkle grated Parmesan over the pasta and drizzle with 1⁄4 cup of the reserved pasta water. Using a large spoon and fork, gently toss the pasta with the butter and cheese, lifting and swirling the noodles and adding more pasta water as necessary. The pasta water will help create a much smoother sauce. 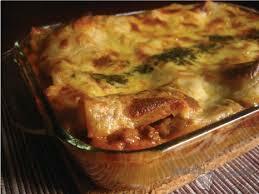 Work in any melted butter and cheese that pools around the edges of the platter. Continue to mix the pasta until the cheese and butter have fully melted and the noodles are coated, about 3 minutes. (For a quicker preparation, bring the reserved 3⁄4 cup pasta water and the butter to a boil in a 30cm skillet; then add the pasta, sprinkle with the cheese, and toss with tongs over medium-low heat until the pasta is creamy and coated, about 2 minutes.) Serve the fettuccine immediately on warmed plates. The Klutz in the Kitchen pays for all food and drink consumed when reviewing venues, and all visits are unannounced and never booked at all. The Klutz will visit the venue again in a few months after the review is published on the website and social media pages. The second visit is to see if any improvements have been implemented and will again review the venue. The Klutz takes careful notes during his visits then after the meal chats casually to the staff and chef about the menu and food to gain a better insight into the venue. His reviews are posted some time after his visit so as to regain a sense of anonymity. See The Klutz in the Kitchens Grub Review here.